On March 9, 2019, at approximately 6:45 AM, pursuant to ongoing anti-prostitution enforcement efforts in the area of Harbor Blvd and Hazard Ave, Santa Ana Police Officers assigned to the Patrol Division contacted a sixteen-year-old juvenile female and identified her as a victim of Human Trafficking. Santa Ana Police Vice detectives responded to assist with the investigation. In cooperation with Orange County Social Services and Waymakers, the juvenile victim was rescued. These agencies coordinated to provide resources and help for the victim. Vice Detectives immediately initiated an investigation into identifying the human trafficker. The initial investigation led detectives to the identity of one of the suspects involved. Continuing the investigation, on March 10, 2019, at approximately 8:15 AM, Santa Ana Police Vice Detectives located the suspect’s vehicle parked at a local motel. The suspect was contacted in a motel room in the presence of two additional female juvenile human trafficking victims, ages thirteen and fifteen. The human trafficker was detained. Representatives from Orange County Social Services and Waymakers again responded to rescue and assist these victims. 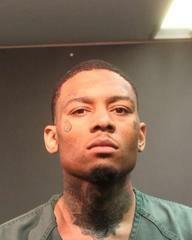 The human trafficker, identified as Malik Malveaux was arrested and booked into the Santa Ana Jail for Human Trafficking of a Minor, Pimping of a Minor, and Pandering of a Minor.